A convicted thief is back in jail after investigators say he posed as a state worker and stole thousands of dollars from Cook County residents. NBC 5 Investigates' Chris Coffey has the story of a man whose dream is now on hold because of the scam. A convicted con man featured in a 2017 NBC 5 Investigates report is back behind bars and charged with posing as an employee of the Illinois Secretary of State’s Office. 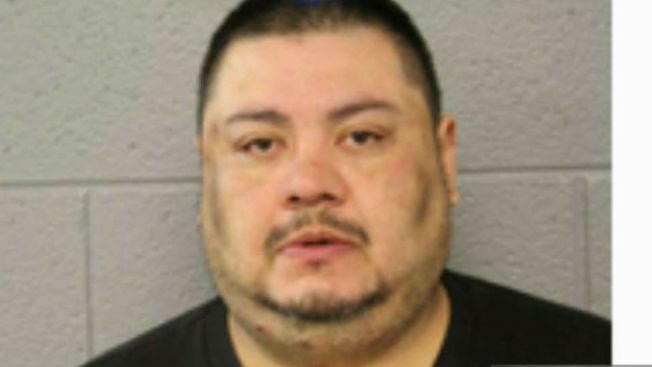 Hugo Torres, 44, was arrested and charged with one count of theft by deception over $500 for posing as a supervisor for the Illinois Secretary of State and taking off with his victims’ money after promising to help them finding jobs or reinstate their drivers’ licenses. Investigators said he ultimately defrauded seven Cook County residents of at least $5,000. “This brazen fraud stripped people of money and highly personal information,” said Illinois Attorney General Lisa Madigan. Private investigator Michael Colella is helping the alleged victims and law enforcement. “We probably have well over a hundred victims, but most of those victims are reluctant to go to police because of their immigration status,” said Joliet-based private investigator Michael Colella. But one alleged victim is stepping forward to warn others. Javier Balderas of Chicago said he has dreams of becoming a truck driver. He said he paid Torres, who identified himself as a state worker named “Jose”, nearly $2,000 to help him a obtain a commercial drivers’ license and a job paying $37 an hour. Balderas said he received nothing in return. “It’s kind of heart-breaking,” Balderas said. Torres received probation after he pleaded guilty to theft in Will County in 2016. He also briefly spent time in a Cook County jail last summer on a misdemeanour warrant. According to a press release, Madigan alleged Torres continued his schemes in Cook County after his plea in Will County. The Will County State’s Attorney is also attempting to revoke Torres’ probation after he failed to appear before a probation officer, according to a county spokesperson. Torres is currently represented by the Will County Public Defender’s office. However, a spokesperson said the office could not comment on any pending cases. The Illinois Secretary of State also released a statement regarding Torres. Concerned citizens are urged to report suspicious incidents to the Illinois Secretary of State Police at 630-693-0551 or contact the Office of the Inspector General at 217-785-2012.